You may have made your own lacto-fermented salsa before. It's easy enough, but it does take some time to chop all the tomatoes and onions, etc. I have just discovered a way to make real lacto-fermented salsa in just 30 seconds. Don't believe me? It's true. Last week, we had some friends over for fish tacos and they brought some jars of fresh salsa from the health food store. If you've ever bought salsa from the grocery store, you know that it goes bad in a day or two in the fridge — so you have to eat it up right away or toss it. The morning after the dinner party, it dawned on me. Why not just add some starter culture to the store-bought salsas? If you can culture homemade salsa, you can certainly culture store-bought salsa. This salsa is the perfect compliment to my homemade corn tortilla chips. Unlike fresh salsa which you can only store in the fridge for a day or two, lacto-fermented salsa will keep for weeks or even months in the fridge. I've kept it in there for up to 6 months! Of course, the best reason to culture your salsa is for the health benefits. Lacto-fermented salsa is loaded with enzymes and probiotics. Read my post about why you want to get more enzymes into your diet. Read my post about why fermented foods are so good for you. OK, if you want to get technical, this is not really 30 Second Salsa because you do have to let it sit on the counter for a day or two. It occurred to me that this would also work for all kinds of store-bought condiments — from ketchup to mayonnaise. We regularly buy our mayonnaise because I don't have time to make lacto-fermented mayonnaise from scratch. See my resources page for a brand of mayonnaise that contains no soybean or canola oil. Why not just open up the jar of mayo and add a little starter culture? 1. Open the jar of salsa. 3. Stir in the starter culture (previously mixed with water) or whey with a spoon. You need 1 TBS of liquid vegetable starter or whey — per cup of salsa. 4. Cover with a lid (on loosely) or a dishcloth, or a paper towel or coffee filter secured with a rubber band. 5. Let ferment on the counter for 2-3 days. 6. Salsa will keep for weeks or months in fridge. This is such an easy and Tasty way to add more Friendlies! Thank you-I’m making this today! This is just terrific – I am going to try this sometime. What a great idea – thanks for the tip! What a wonderful idea. I can’t wait to try it. That is brilliant! But I do have a question. I tried to make my own once, but when I opened it, it was BAD. Too salty, and like the tomatoes had fermented with that “oh-you-don’t-want-to-eat-that” zing and taste. Please tell me it’s not supposed to taste like that? I mean, I know it’s lacto-fermented, but… or do I just need to get used to that taste? No, it is not supposed to taste like that. It should taste just like regular salsa. Which recipe did you follow? How long did you let it ferment? Did you use fresh tomatoes? How much salt did you add? Try adding less salt next time, and maybe don’t ferment it as long. Thank goodness. I did use fresh tomatoes, but I’m pretty sure I messed up on several of the steps (not enough whey, left it out on the counter too long). I just needed a little extra hand-holding to get up the nerve to try another batch! Thanks! I had the same problem with a batch I just made! Was terrific the first few days but now, about a week later, after being stored in a capped mason jar in the fridge, it is bubbly and hissy with that tongue zap.. What did I do wrong? Can you add some of the liquid as a “starter culture” from a previously fermented vegetable product, such as homemade sauerkraut? I never have whey around when I need it. Can I use the juice from Bubbie’s pickles or kraut? Hmm I guess you could try that — I’m not sure if it would taste weird to add pickle juice. When I don’t have any whey, I just strain my kefir and make whey — I always seem to have kefir around. I was just lamenting that none of our condiments are actually fermented which was really the whole point of them in the first place, i.e. to help us digest the meat and cheese and other stuff! These days condiments (and pickles and sauerkraut) just make it harder to digest unless you get the truly fermented kind (there are delicious lacto-fermented pickles at Erewhon). This is so simple, but that’s what most good ideas are like. :) Ketchup and salsa will be the first experiments. Thanks! Hannah, I can’t believe I never thought of it before! Is it better with the bought culture as opposed to whey? I have never used the bought culture. But it is a good option for dairy-intolerant people who can’t digest whey. That is such a great idea. 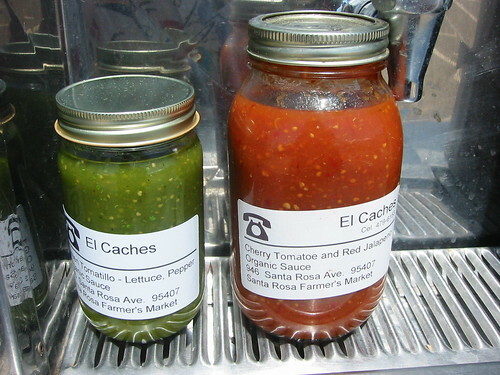 We often buy Garden Fresh Salsa (semi-local – it’s made in Michigan) when it is buy 1 get 1 free. But we can never eat it up in time and I always end up dumping some. Yay for no more wasted food! Question…I did try making fermented salsa once, and it tasted like cheese. I could tolerate it but I wouldn’t describe it as delicious. Any thoughts on that? Does the whey make it taste that way or did something go wrong? If it tasted like cheese, I’m guessing you added to much whey, or you had milk proteins left in the whey, or you left it fermenting too long. This post is just a little late for me as I just threw away half a jar of salsa. I buy it at the farmer’s market, so it is freshly canned and without preservatives. I don’t eat salsa that often so it just sits in my fridge and gets moldy. I have thought of putting it in smaller containers and freezing it. But I always seen to get busy and forget. Lacto-fermenting it seems to be a good solution. It will be better for me and I can keep it around for much longer. What a brilliant and easy idea. I get my whey from my raw milk yogert. Yummie!! I just made up a couple of jars, easy and awesome when you are on the run. 2) One quick note: Fresh salsas seem to be a good idea, but aren’t most salsas in a jar pasteurized (during canning process)? Also, many of them contain “natural flavors” and other chemicals. Obviously, read labels, but I wonder how the dead foods do with fermentation. Good point about the pasteurization. I am not sure — I think you can find some salsas that are not pasteurized. I’ll have to look and see the next time I go to the health food store. But even if it is pasteurized, it’s still better than eating it without fermenting it. You won’t get the enzymes but you will get the probiotics. I did this a couple weeks ago with organic ketchup. I mixed about 1.5 cups of the ketchup with 1 small can of tomato paste (so it is less sweet) and then about 1/4 cup of lactofermented pickle juice (I used Bubbies). You can’t taste the pickle juice at all– it just tastes really good! Wonderful! Glad to know the pickle juice worked. Costco has a 4 lb. 2 oz. jar of Kirkland ORGANIC salsa: Organic tomatoes, organic jalapeno peppers, organic onions, water, organic tomato paste, organic cilantro, sea salt, organic sugar, organic vinegar, organic cumin, organic garlic, organic cayenne pepper. When we haven’t made our own salsa, this is a great alternative and with your suggestion a big jar will not go bad before it’s used up. Thank You!! Wow, I feel like I’m in the twilight zone right now….just hopped over to your blog to find your recipe for lacto-fermented salsa, and as the main page was loading, I thought to myself, ‘I really should just use up that jar of salsa I bought out of desperation a couple months ago, but I really want some good probiotics, but at the same time, I really wish I could take a shortcut to get there’ and lo and behold, I find this handy little article! Definitely going to give it a try! Haha! Great minds, as they say! And to add my thoughts to your discussion with the other Alex about what if it’s pasteurized–I don’t think this is a problem. It’s like making yogurt fromo pasteurized yogurt vs. “raw” yogurt. You won’t get a lot of the naturally-occurring enzymes from the vegetables, and you won’t get the naturally-occurring microbes, but the microbes you add will have very good odds of making a home for themselves, and they will make vitamins and enzymes in a predictable way. Proof positive that great minds think alike! I’ve been doing this for awhile now! As far as using previously-pasteurized goodies, I started making my LF salsas (the hard way, chopping, blending, etc.) using canned tomatoes when I was waiting for my tomatillos to come in (Oh my, tomatillo salsa! LF tomatillo salsa=even better! ), and it works just fine. No, it doesn’t have the raw food microbes, but it livens up just with the addition of the whey, and the flavor is excellent either way. Uhh,….ok, so I tried this twice now, both times with fuzzy mold growing as a result–never had that problem with homemade LF salsa…I know that with other fermented goods, NT just says to skim it off, but, it’s just.so.fuzzy! I covered it with a towel…should I have put the lid back on instead? I vaguely remember doing that with the homeade stuff. Why loose lid or dish cloth? I usually do LF veggies with a tight lid, and have done one batch of LF Quicky Salsa with a tight lid, and it was super awesome… Just mixed up our second batch… Any reason in particular to keep the lid loose? I just bought a jar of organic Korean soy sauce. I know it’s bad, but I bought the best I could find with only a few ingredients. And I love good sushi. LOL Can I add whey and ferment it, too? Awesome idea! I LOVE fresh salsa- but it always spoils before we eat it all. I’m thinking about taking some liquid from my cultured veggies to use as the starter. why didnt I think of this? lol this is great, I looooove the salsa we carry at my co-op but I have to eat the whole thing so fast (not that that is a problem, because its good on everythinggg) but it’d be nice to be able to store some in the fridge for later use. Love your website and so glad I found you through google. I am new to lacto-fermentation, and love the idea of the 30 second salsa. Is whey collected from store bought yogurt good for these kind of projects, or do I need to make yogurt from culture at home, and drain why out of it? Yes you can use storebought yogurt! Whey from store-bought yogurt is fine. For best results, get plain, unsweetened full fat yogurt, without any odd ingredients like non-fat milk powder. Also check the dates and get the youngest one you can, because younger yogurt will have a more powerful set of bacteria in it. Since I am brand new to lacto-fermentation. My question is, I have heard and need some guidance on whether it is advised to REFRAIN from making such lacto-fermented veggies when a woman is menstruating. Is this an old-folks tale or is there some scientific stuff behind it? I make goat milk yogurt cheese (which tastes like chevre!) and use the whey for my fermented salsa (labor intensive version) and it is delicious! Thanks for this tip on using the whey to ferment fresh store bought salsa! So smart, I will try soon! I’d love to know where you can buy mayo without soy and canola oil, but couldn’t find it on your resources page. Thanks! can I use my saurerkraut juice as a starter for fermenting salsa?